At the intersection of Broadway and East 11th Street andon the edge of Greenwich Village, a new boutique office will soon rise at 799 Broadway thanks to a $70 million purchase by Columbia Property Trust, according to Crain’s. Columbia received a nearly 50% stake in the sale, and will join co-owner Normandy Real Estate Partners. The current structure today will eventually be demolished to make way for the new glass building that will span around 180,000 square feet, and stand 12 stories tall. In total, the project is expected to cost around $150 million, give or take, on top of the $70 million acquisition. Perkins + Will is the designer. Adam Spies and Doug Harmon of Cushman & Wakefield are in charge of the sale, which will close later this year. 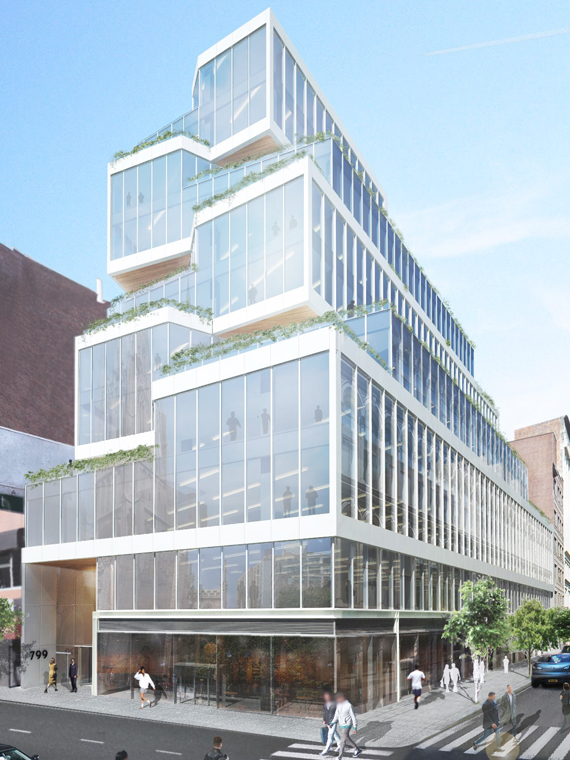 The new building, based on the current rendering, shows a stacked elevation of floors completely surrounded by glass windows, with minor sloped sections joining the staggered pattern of levels seen along the Broadway elevation. This resembles a similar design to the Columbia University Medical Building by Diller Scofidio +Renfro, but in miniature form. Greenery and landscaping will wrap around the building’s exterior. The site sits between Union Square Park to the north and Astor Place to the south, while Grace Church sits across the street to the east. No completion date or demolition schedule for the project has been announced yet. 2 Comments on "Boutique Office Building Will Rise at 799 Broadway in Greenwich Village, Manhattan"
Please pardon me for using your space: Me doesn’t mind on no completion date or demolition schedule. See its main purpose. This is not thoughful or creative architecture. It looks like it is merely copied from some international pattern book of generic glassy buildings. The glassy exterior might be ok in certain midtwon precincts or on the far West Side, but it seems highly inappropriate for this corner in Greenwich Village which is acroos from Grace Church and otherwise surrounded by traditional masonry buildings.